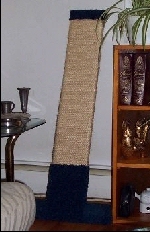 FT45 - Low Profile, Extra wide, wall hugging, sisal rope scratcher. Easy assembly and take-down. 45" high. Supplied fasteners and easy assembly tool. Please give any alternative color choices. Note: To avoid shipping delays, please select your state from the drop-down menu.